The Serenissima for centuries ruled a large territory including what today is called the Italian North East. Besides, the Venice government extended along the coast land belonging today to Croatia. During this trip the focus will be the blending of the local culture and art with the Venetian style. Arrival of the participants with their own Tour Manager at Venice Airport. Private coach transfer to the hotel in Sacile/Vittorio Veneto. Welcome drink and presentation of the itinerary. Free time to explore the town welcome dinner. A day of Tesori Svelati. Have a cappuccino in one of the best known pastry shop in town. Guided visit of the masterpiece of Vittorio Veneto, the Battuti Chapel with its XV century frescoes. Taste the best home made bread in a wood oven operating for over one hundred years. Visit the Prosecco winery and taste the sparkling wine we are proud of and the special sweet wine produced in the farm. Have a light lunch based on local cold cuts produced by nearby farms. Visit one the most beautiful Pieve (Countryside church) on the Prosecco hills and our most hidden treasures. Travelling through the Road of Prosecco, you can reach the town of San Pietro di Feletto, about 15 minute drive from the city of Conegliano. From this tiny town you can enjoy a breathtaking view over the surrounding hills, and much more. In this village, infact, you can visit the “Pieve, an amazing work of the Lombardian era. It was built around the year 1000, but since the 7th and 8th Centuries it was used to host many religious functions, baptism in particular. The Pieve was the only Church in the surroundings with the baptismal source. There are many frescoes inside and outside the Church. In particular we want to highlight the one under the large wooden porch, called “The Christ of the Sunday”. The warning of the precious fresco is clear: on Sunday people must rest. Those who work in the Lord’s day, made the Christ suffer. The painting is also interesting because it shows the tools and the types of work that the locals were used to do in those years. Despite its tiny size, the Pieve offers visitors a varied and unusual artistic performance. Visit one of best known osteria (local bar) and taste a cicchetto (the Typical Venetian appetizers). Back to the hotel in the evening and free time. A day in Asolo and Bassano del Grappa. After breakfast depart to Asolo a pearl on the hills. Visit the town with a local guide. Asolo is one of the most picturesque old town centres in Italy. Contained within the ancient walls that branch off from the 12th century fortress, in every corner it preserves testimonies of its thousand-year old history. A fascinating place on the rolling Asolan hills, Asolo was a destination for poets and writers, artists and travellers that found inspiration and harmony here. Among them the English poet Robert Browning, the Divine theatre actress Eleonora Duse, the composer Gian Francesco Malipiero, the English writer and traveller Freya Stark. A visit to Asolo allows you to combine the pleasure for history and culture with that of dining. In taverns, restaurants, cafes and wine bars that overlook the characteristic arcades and squares you can enjoy delicious dishes prepared with the finest local produce and linked to the Venetian culinary tradition, such as the delicious Cicchetti. All accompanied by a glass of sparkling Asolo Prosecco Superiore DOCG, the excellence of our land. Learn about the Bacaro and the Baccalà (Salted cod fish), a tradition that goes back to the XV century. 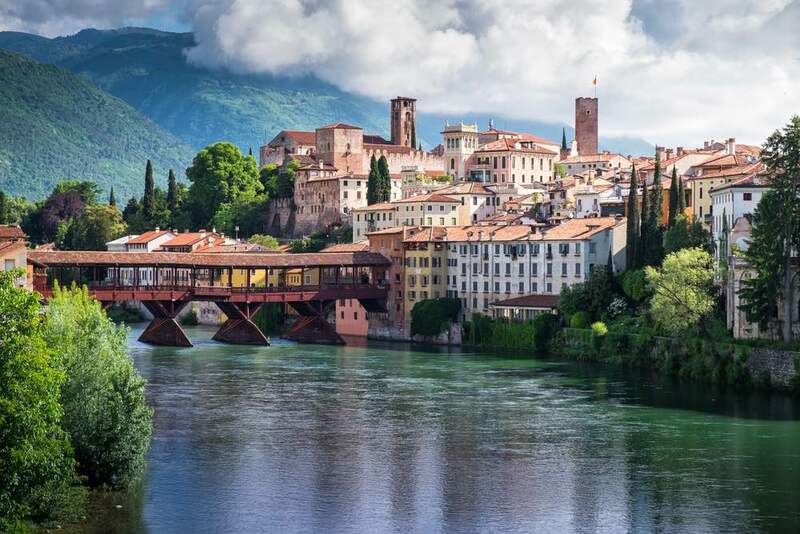 In the afternoon, visit Bassano, a another Venetian pearl, famous for its three squares, the bridge and the local grappa (a strong distillate). In the evening back to the hotel for some rest, free time for dinner and catch the Italian spirit. After breakfast have a ride to the Cansiglio valley. An enchanting nested side in the Venetian territory. Walk through the frisky air from two villages whose names remind the ancient local population where people live since 400 years. Have a local tea in a panoramic Café. Have a light lunch in the area. On the way back stop in Fregona for a visit of the inside bell tower, a local unveiled treasure. The afternoon, enjoy the visit of Palazzo Minucci, the violin concert and the homemade cake taste along with a special sweet wine. Back to the hotel and free time for dinner. Palazzo Minucci De Carlo was built in the late sixteenth century by the will of Minuccio Minucci (Serravalle 1551 - Monaco of Bavaria in 1604), diplomat of the Holy See, in charge of the Vatican Secretariat of State in Germany, Archbishop of Zadar. The Palazzo has an imposing façade with wide arches rusticated on the ground floor, a quadrifora on the main floor, which corresponds within the the sumptuous main hall, and, on top of this, the arms of Wittelsbach, the Bavarian dukes and princes of Palatinate. Adjacent to the palace, from which is also accessible internally via an elevated tribune, there is the Chapel of the Holy Cross, originally dedicated to San Francesco, a private oratory of the Minucci family. The interior of the palace is characterized by a rich and eclectic decor, where fine furniture, artworks, precious and exotic objects create a unique and charming together. This is all due to the last owner of the palace, Giacomo Camillo De Carlo (Venice 1892 - Vittorio Veneto, 1968), who wanted that what he had collected, and so provided in an absolutely original way, was kept intact after his death, as a testimony of his own taste and of his age, and that, with the establishment of the "Foundation Minuccio Minucci", was turned into a museum for public enjoyment. Villa Emo is one of the most famous Palladian Venetian Villas. It was commissioned to Palladio, who built it in 1557-1560, by the Venetian nobleman Leonardo Emo, and represents the highest example of a Villa-farm: perfectly embodying the seamless relationship between the aristocratic mansion and the surrounding countryside. The main body of Villa Emo, or the manor house, shows a classic design with Doric columns, a vestibule, a large hall and rooms arranged symmetrically on both sides. The barchessas, formed by long arched porches, were the working areas and used to host the wine cellars, barns and granaries. Overall, Villa Emo represents the ideals of classic proportions and harmony. The halls of Villa Emo were entirely frescoed by Giambattista Zelotti in 1565. These frescoes correspond to the ideals pursued by the client, with scenes inspired by mythology and life in the fields that celebrate the household and family virtues, as well as the social harmony between the landlord and his workers. Rovinj is located on the western side of the Istrian peninsula, from Lim Fjord on the north, to the town of Valle (Bale) to the south. It has a very rugged archipelago consisting of 14 islands and 6 cliffs. The conformation of the beaches of Rovinj is typical of the coasts of the northern Adriatic. Rocky headlands and coves with sand and pebbles alternate along the 67 km of the coast of Rovinj. After breakfast ride to Treviso for a guided tour of the city. Free time for lunch and for browsing around the city center. In the afternoon visit one of the most beautiful Venetian Villas. Back to the hotel in the evening for dinner and relaxing at the hotel. The venetian heritage across the waters. Have an early breakfast and get ready for a ride to Parenzo in Croatia. There board a boat for a day cruise along the former Venetian coast (Venice ruled for centuries in both sides of the Adriatic). Have simple lunch on board based on the catch of the day. In the afternoon pay a visit of the enchanting Rovigno nested between the hilly coast and the sea. Have a great breakfast and say good bye to Italy. Ride the bus to the airport Venice.